With his final game on Sunday versus Genoa on the near horizon, AS Roma legend, Francesco Totti, makes a humorous yet historically accurate examination about his favorite places in the eternal city of Rome. "Roma versus Genoa, on the 28th of May, 2017, is the last time I'll be able to don Roma's colors. It's impossible to express in a few words all that these colors represented, represent, and will represent for me. Always. I feel only that my love for football isn't fading away. It's a passion; my passion. And such that it is so profound that I can't think of stopping to feed it. Ever. From Monday, I am ready to start off again. I'm ready for a new challenge." 25 years for Roma (23 in which he scored a goal which is the absolute record.) Paolo Maldini and Totti share this record for longevity. 250 Serie A goals which is second behind Silvio Piola's 274 goals. Totti is the all-time Italian leader for goals with the same club. At 38 years of age, he became the oldest to score in the UEFA Champions League in 2014 versus CSKA Moscow. 11 goals scored versus Lazio in 44 games. Joint leader with Da Costa. 618 Serie A appearances (619 v. Genoa.) Second behind Paolo Maldini and tied now with Gianluigi Bufffon. 9 goals in 58 Azzurri caps. FIFA 2006 World Cup winner. 91 penalty kicks converted from 113 taken. Absolute Serie A record. 9 team presidents during his time at Roma. 37 Serie A games versus Lazio and Milan. 36 versus Internazionale. 19 goals scored against Parma. Then, Sampdoria at 15, Cagliari and Udinese, 14. 11 goals scored against Gigi Buffon in 28 games. 46 braces scored in Serie A. He also had six braces in European Cup competitions. Source: Chiara Zucchelli of La Gazzetta dello Sport on 27 May 2017. My translations. "Niente da fare, quando vengono a Roma, i giocatori stranieri rosicano. Fateci caso alla prossima partita della Roma contro una squadra europea se non picchiano giu' duro: e' per colpa della bellezza dei nostri monumenti. Uno sgambetto per L'Altare della Patria. Un tackle in scivolata per la Domus Aurea. Un'entrata da dietro per le Catacombe di San Callisto. Allora mi sono detto: un po' per il famoso fair play della Champions League, un po' per il tifoso che viene in trasferta con la sua squadra, un po' per la voglia di parlare della mia citta' -- che e' un po' come se ci potessi passeggiare --, mo' la scrivo io una piccola guida da Roma. Una cosetta semplice, con i luoghi piu' rappresentativi, i personaggi famosi e qualche curiosita' storica. Sperando, alla prossima partita, di avere un calcio nelgi stinchi in meno e un turista in piu': il mediano del Borussia Monchengladbach." '"With nothing to do, when they come to Rome, foreign players eat their hearts out. Tell us if during the next game of Roma versus a European team if they don't knock us around harder: It's due to the beauty of our monuments. A trip for the National Monument to Victor Emmanuel II. A sliding tackle for the Domus Aurea (Nero's Golden House). A challenge from behind for the Catacombs of St. Callixtus. Then I said to myself: A little for the famous fair play of the Champions League, a little for the away fan who travels here with his team, a little for the desire to talk about my city -- that it's a little like if you could walk about --, I'm writing a small guide to Rome. A simple text, with the most popular places, famous persons and some historical curiosity. Hoping, at the next game, to have one less kick in the shins and one additional tourist: the holding midfielder of Borussia Monchengladbach." --- Francesco Totti, author of "E Mo' Te Spiego Roma: La mia guida all'Antica Roma," (And Now I Explain Rome to You: My Guide to Ancient Rome) page 11, published in 2012 by Biblioteca Umoristica Mondadori, with a retail price of 12,50 euro. Francesco Totti: The King of Rome. Francesco Totti. Er Purpone (The Big Baby). il Capitano. Roma icon. "The King of Rome" as he was christened by Richard Whittle a few years ago. L'uomo simbolo (the flag bearer) who has spent over 20 professional seasons donning the maroon red and yellow colors of AS Roma. Needless to say, I was curious to learn Totti's perspective about his beloved Rome. He has authored a few books in the past. 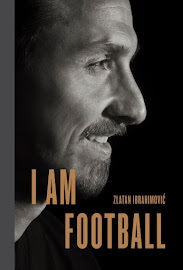 Notably, two joke books poking fun at himself with the proceeds donated to UNICEF (where he is a children's ambassador.) 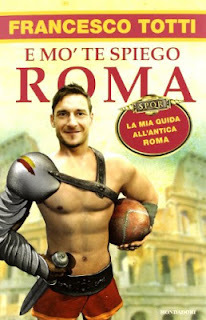 But a book about ancient Rome by Totti? Would it be the literary equivalent of a ride around the eternal city on a Vespa scooter yelling insults at Lazio supporters? This guide was more akin to a sprint around Rome by the decorated Italian motorcycle racer, Valentino Rossi. I would dare to say that Frommer's or Lonely Planet would be hard-pressed to beat Totti on this interesting, informative, intriguing and provocative guide about his native city. There is a brief introduction, detailed table of contents along with 10 chapters (in Roman numerals of course.) There is also a photo credits page although the author didn't include an index or acknowledgments list. Each chapter details one of the author's favorite places in Rome. He covers Apollo's Temple, La Bocca della Verita' (The Mouth of Truth), the Coliseum, the Forum, Ponte Milvio (the Battle of Milvio's Bridge), the Pantheon, St. Peter's Basilica, and the Seven Hills of Rome. Totti's writing style is conversational, entertaining, humorous but his serious side is readily apparent. His love of Rome, along with its history and people, is as apparent as his Roman nose. He entertains and educates his readers. Francesco Totti and AS Roma President, James Pallotta. "Ave, Caesar, morituri te salutant!" The author also had a grasp on Greek mythology explaining how the son of Apollo, Apelle, made a ball of chicken skin. Speaking of Greeks, Totti recounted an interesting way that he learned Greek vocabulary from a former Roma teammate, Traianos Dellas. The Greek player used to tease Totti that most Italian words had Hellenic roots. Until one day in the dressing room, Totti said: "Lo sai che ce n'e' una che no viene dal greco? 'Impossible.' Vuol sapere qual e'? La parola e' 'greco'. Caro Dellas, 'greco' viene dal latino graecus. Dal latino, capisci?" While this book is a guide to Rome, Totti does interject a few anecdotes from his playing career, as demonstrated in the above quote, with great effect. He explained in his chapter about the Pantheon that it was the largest building in Roman antiquity constructed of concrete. Totti quoted from a book by the architect of the Pantheon, Marcus Agrippa (Abusii Edilitiae), who explained that concrete was constructed from blocks of limestone (rocce di calce) mixed with ostriches (struzzo) imported from Africa. The quoted material from Agrippa's book also contained the Italian word for stone mason, muratore. This was originally given to ancient gladiators (muratores) who had the special task to catch the ostriches according to Totti in a humorous sense. Regarding the word "Calcestruzzo," according to Jacopo Piotto, Totti was half right. The derivation of "struzzo" comes from a Latin word for structure even if struzzo as Totti noted, does mean "ostrich". Francesco Totti and Michael Bradley et al at Disneyworld Winter Break Training in 2013. From a picture of the Brazilian goalkeeper, Julio Cesar, situated next to a sculpture of Julius Caesar, in images but more frequently in words, the author displayed a sharp wit. Totti also used ancient history to introduce the more present variety. For example, he described the Seven Hills of Rome in a unique yet enlightening way as if they were football teams: "Dall'altra parte, gentili telespettatori, risponde il dream team dei Seven Kings con il capitano della Nazionale, Romolo, affiancato dai due difensori esterni Numa Pompilo and Tullo Ostilio..."
Totti then interjected a discussion about the Jean-Marc Bosman Ruling that has had significant effect in world football in his chapter on the Seven Hills. He provided an ancient history lesson with a current one in a humorous and informative display. Totti used a similar technique in his chapter about St. Peter's Basilica. He noted the polyglot nature of Vatican City which prompted him to launch into an interesting story when he tried to communicate in English with a referee in the Champions League. The author created a dialogue between historic figures with a present-day examples which was another intriguing literary device. In this example, Simon Peter, Andrew and Jesus of Nazareth discussing the reason of Simon's name change to Peter. "Pensa che fra due mila anni verra' uno che si chiamera' Ricardo Izecson dos Santos Leite ma gli cambieranno il nome in Kaka'. Eppure non dira' niente. E sara' un famoso calciatore messaggero di fede. Tu vuoi chiamare Kaka' pure tu? Poi cosa gli facciamo scrivere nei Vangeli? 'Il Salvatore insegna a Kaka'?' Su Simone, fa il bravo e fatti chiamare Pietro." "Chiamami pure Zeus... 'Si, Zeus, dicevo, sei veramente una potenza. Io invece sono cresciuto in un ambiente cattolico. Quasi quasi mi dispiace, se no potevo diventare un tuo seguace... E' difficile che un bambino cresciuto in una famiglia cattolica, in Italia, che va a messa tutte le domeniche, improvvisamente diventi, che so, un Hare Krishna. Cosi' come un ragazzino di Palermo che gioca a pallone in mezzo alla strada e cresce col mito di Miccoli, difficilmente diventera', da grande, un ultra' dell'Udinese.' "
Rome Walks: 48 Hours in Rome. I really liked the black and white photographs that he used. They provided an antique look to complement the historical content. My favorite: La Bocca della Verita' (The Mouth of Truth). "E cosa dire, oggi, del portiere del KS Cracovia? In campo porta con orgoglio, scritti sulla schiena, il suo numero e il suo nome: 35 MERDA. Ecco, ve lo dico subito, se mai incontrero' il KS Cracovia e a fine partita il portiere vorra' scambiare la maglia con me, io gli diro' di no. Non e' per cattiveria, ma sarebbe un fardello troppo grande da portare sulle spalle." "Merda" means "s*it" in Italian and is also a derisive term used by some Italian soccer fans for Internazionale Milano. Lukasz Merda was the player in question from this quote. "Ma certo: l'elmo, lo scudo e la spada, il gladio. Vorrei ricordarti che la parola 'gladiatore' viene proprio dalla parola latina gladius, cioe' 'spada'..."
"Gladio" refers to the smaller type of sword used by ancient Romans and is pictured on the book's cover image above. "A Ponte Milvio, nell'ottobre 312, sia accaduto quello che successe a Genova nell'ottobre 2010. Deve essere proprio il periodo: a ottobre i serbi sono un po' inquieti." Translator's Note: Totti was referring to the 312 A.D. Battle of Milvio's Bridge with Constantine I who ruled what is now present-day Serbia. The October 2010 European Nations Cup qualifier between Italy and Serbia was suspended in the first half due to fan problems. Italy was awarded a 3-0 win by UEFA. "E gli e' andata pure bene, agli americani, che il navigatore italiano si chiamava Amerigo. Pensa se, per esempio, si fosse chiamato con uno dei nomi piu diffisi in Italia, Giuseppe. Avrebbe battezzato il nuovo continente col nome di Giusepponia o Peppelandia. Te l'immagini la Peppelandia che invade l'Iraq?" "La Bocca della Verita' e' uno dei monumenti piu conosciuti di Roma, e quindi del mondo. Hanno anche provato a imitarla: a Buenos Aires, in Argentina, hanno fatto una Bocca della Verita' piu' piccola e l'hanno chiamata Boca Junior. Ma dai! Sto a scherza'..."
Totti used the singular for Boca Juniors (Junior) as perhaps a play on words for "a smaller Mouth of Truth." Boca in Spanish means "mouth." Photo credit: Beyond The Pitch. "E' meglio che ognuno faccia quello che sa fare meglio nel mondo e nel periodo storico che gli appartiene." (c) 2012 Arnoldo Mondadori Editore S.p.A., Milano. "My heart belongs to Roma." Interview with Julian Movsesian of DiBenedetto AS Roma LLC in February 2011: "I have followed Italian soccer for over 40 years."